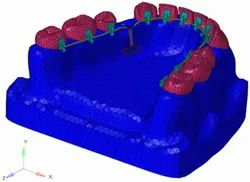 We provide Finite Element Analysis into Dental Implants . We are a leading service provider for the Finite Element Modeling. This service determine stresses, strains, deflection, factor of safety, margin of safety, forces, energies, etc. We have the expertise to complete challenging meshing assignments for automotive and other engineering industry. Our meshing expertise covers almost all types of meshing requirements. 6 months Post Graduate Diploma in Finite Element Analysis & Modeling. Develop skills in carrying out Finite Element Analysis & Modeling of industrial components - AutoCAD, Pro/Engineer, CATIA, Ansys Workbench, Hyper Works. We help you determine stresses, strains, deflection, factor of safety, margin of safety, forces, energies, etc. By using linear/ non-linear analysis techniques. Engineering Technique provides best quality CAE services ( CFD Finite Element Analysis ) at affordable prices. Contact us now to get a free quote. Finite element analysis (FEA) conducted by Delta Engineering Design Services with the help of sophisticated software and modern tools will help in predicting the capability of equipment and structures to withstand the structural and thermal loads along with determining equipment lifecycle. The #1 Rated Research Software Package for 3D Biomechanics Analysis and Modeling. • Flexible Modeling - Global Optimization, 6 DOF, Conventional Gait, Virtual Markers, and more. • Biomechanics Calculations: 3D Kinematics, 3D Kinetics, & EMG. • Incorporated Force Sensors, Force Platforms, Instrumented Stairs and Instrumented Treadmills.